This, that, these and those pronouns are used instead of the noun name in Thai as in the English language. The words ‘this’ in Thai is ‘นี่ /nîi/’ and ‘that’ in Thai is ‘นั่น /nân/’ are spoken with a falling tone when used alone as pronouns. However, when used with a noun, we are spoken with a high tone (นี้ /níi/, นั้น /nán/) and like Thai adjectives, we follow the noun we refer to. 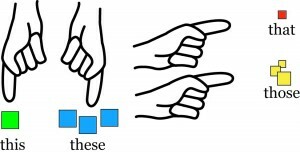 To say ‘these’ and ‘those’ add the word เหล่า /lào/ or พวก /pûak/ before นี้ /níi/and นั้น /nán/. Want to learn more Thai then either search our other Thai lessons here on this site where we have over 450 lessons or on our YouTube site where we have over 250 YouTube lessons. Want help and are serious about learning Thai – then please contact us. We can help teach you Thai Online wherever you are. Our programs are very flexible to fit in with your availability and learning requirements in addition to being open for one year. I hope you can now confidently use these Thai Grammar Pronouns confidently. Now go and practice with your friends :-).